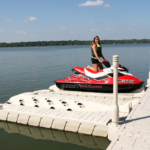 Lifts extend the longevity of your boat or personal water craft (PWC) and aren’t just for removing your craft ahead of storms or changing water levels. Boats will naturally absorb water when sitting for extended periods of time in the lake. Algae can harm the paint and the water can cause deterioration of the vessel. Keeping your boats and PWCs out of the water when not in use can save you lots of time and money in repair work. 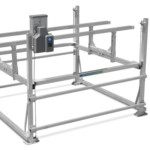 At Master Docks, we supply and install several types of lifts: Stand Alone Lifts, In-Slip Lifts, and Drive On Lifts for PWCs. See below to learn more about each type. Lifts not needed to be attached to a dock. 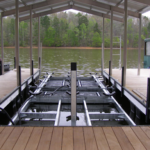 Floating lifts incorporated into dock designs. An efficient method to quickly remove your PWC from the water. Not seeing what you are looking for? With various lake regulations, we have other Lifts available should your location have specific requirements. Contact Us to learn more about our other options specific to your lake.